Each and every week, we Poets gather. Each and every week we lay down our words, standing defiant against those who are wondering just what the heck we think we’re doing. Were you called to do this? My Name is Natasha Head, and I fear a new addiction! Those around me regard me as though I have three heads when Tuesday rolls around. They can’t get me to do anything…no matter how they try to sweeten the deal. I am committed. My time is spoken for. I am at dVerse, and I am mingling with folks who never question my motives for being here. At this point in the realm of the real world, I have been put into the position where I am able to live my nightmare…and I’m surviving it. Each punch and kick to the teeth are just poems waiting to be written, and all I have to do is make it to Tuesday where I get to share, to lighten the load and find the inspiration within YOUR words to carry me through. So today, I simply want to say “Thank you”. Thank you for making dVerse so freaking awesome! Shall we share a poem? Post a poem to your blog. Today YOU decide the prompt. Maybe the poem has already been posted and has just been waiting to be shared? Copy the url of that post and paste to Mr.Linky, add your name, click submit and you’re in! Return to Mr.Linky where you’ll see the links to all the other poets who have offered up their work for sharing. Simply click on the desired link to read the poet of your choice. We are community and this is where we come to life! Comment, share and engage your fellow poets. Send a tweet of a new favorite, tell your facebook family about this awesome write, Stumble this fantastic new entry…you get the point. Show the POET LOVE! First, maybe! And seventh on the links, maybe! Great opening Tash, and great poem today! Thanks for hosting, I am already looking forward to getting drunk on words! So much safer that way! 😉 And thanks to you for your comments and rt’s! Means alot! I need something strong and deep in a tall glass. What do you recommend? Love it Tash, you keep showing up, it counts for so much! I won’t be around to read for a couple hours as commitments pull me away but I’ll be back with enthusiasm and encouragement soon. Thanks Tash, it’s great to be back! To anyone who may have commented but hasn’t seen it appear I am not the administrator on the Carbon Noise site. As soon as your comments are cleared I’ll be responding as usual :). Looks like all the comments have been cleared and I’ve responded to all. Thanks for your patience, the insightful and helpful comments, and your valuable time. You all are awesome! That is a difficult thing to do … keep pace with Brian, that is. Thanks as always for hosting this! Here’s my Uptight Limerick. One of the things I just love about hanging out here in the Pub is the sense of support and community, it’s truly an amazing place! Thank you, Tash, and thank you dversepoets.com. Posting just 3 Spring Tanka and 3 Spring Haiku…..ACHOOOO! These allergies make me feel drunk. t’is the season! Can’t wait to visit…we’ll share a sneeze over a hot toddie or two! With you there, Tash. Yesterday the allergies (before, never) really kicked in and I felt the full fury of them. Yikes! I love this season so much, it is ethereal as Gay says, but one does suffer from the pollen! That hot toddy could really help. Will be around tomorrow more when my head clears! And thank you, again. I apologize that I’ve been remiss in my reading and commenting lately. I plan to remedy the situation today and tomorrow! Cheers! becky your write tonight was a trip…. Pure, unadulterated doggerel at my place today – but I had fun writing it and that’s all that really counts. Thanks for hosting Tash, and I hope you have some better things to write about soon. That’s why I love OpenLinkNight…allows me to steal some good vibes from you wonderful wordweavers 🙂 Thanks for playing! Thank YOU, and your band of orchestrators. I’m having so much fun with these words all of a sudden. Two weeks ago was the birth of my first poem. Do I hear a plea for a word intervention 🙂 Frightfully addictive isn’t it! Hi Natasha! Here’s to living the nightmare and surviving it… As you say: Each punch and kick to the teeth are just poems waiting to be written. That’s the spirit! Seems to be more than a poet or two in need of a hug…your timing couldn’t have been more perfect! If i know I’m going crazy then I must not be insane! There hope for me yet…Louise, your piece was fantastic! Thanks for hosting another Open Link Night. I appreciate the chance to share and read. We appreciate the opportunity to read what you’re sharing! Strange? A word I am too fond of 😉 On my way! Hey, if you happen to read my poem this week… Maybe you could also read my post from yesterday — a great conversation. What do you mean “if you read my poem?” Try and stop me lady! Thank you Tash and everyone at the pub. Thank you Bren…for sharing with us! always great to see you og! Hi Tash! Hope you are getting some springtme there! K.
Ha! In the midst of a Winter Storm warning…but I did get a sun burn last week! I’m a bit frazzled, as you’ll read in my poem, but will try to do my best mingling tonight. booyah….what better way to spend the lunch hour…. I mean COMMITMENTS! Let’s see, there’s NAP commitment, and all those ‘eating’ commitments, telephone, Starbucks, meetings GALORE–not to be confused with ‘other’ galore—-grin! 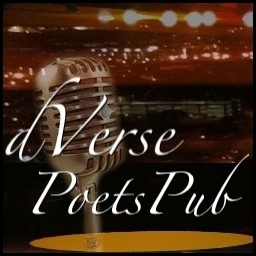 So once more, thank you for giving you opinion in your words, which I guess, I’m finally ready to understand as real, humble, and honest gifting of D’verse Poets Pub, this space they give us to have fun, and help others to have their fun. Blessings to all the Peeps who come here. steveroni, your light is a blessing for us all! Here’s to all the wonderful folks here that make this such an awesome forum for the craziness that is life. We’re all in it together! Thanks for hosting tonight, and carrying the flag for self-expression every day and night, Natasha. Happy open link night everyone! Busy writing day but wanted to contribute..
Have a wonderful night, happy reading and penning always! A busy writing day but wanted to contribute. Have a great night, happy writing and reading always! It’s great to be back. I have gotten out of the daily poetry habit and am trying to make it my daily ritual again. Always glad to have this great forum to share and be inspired. Thanks to Dverse for being here and thanks to all the great poets who inspire us. You sound stronger and more empowered every time I read something from you. Those hard times do have their reason for being…they do make us stronger. I’m glad I can be of help, glad to be able to give you more time to devote to the things and people you love. Enjoy your evening. I’ll lurk here and there when I get a chance over the next couple of days, but life has me pretty busy lately, too. Next week I hope to be sharing some words of my own. Cheers to all you dVerse poets! Everyone’s words each week make my life less lonely and a lot more full in this poetical endeavor. I appreciate each and every one of you. And I’m not just sayin’ that cause I’ve had “a couple!” I really mean it! My poem was written out of sheer frustration. I’m sure all of you poets will be able to relate. “standing defiant against those who are wondering just what the heck we think we’re doing” … Indeed!!! Glad to see all you fine poets here again on DVerse! I don’t like this since I feel like I’m taking advantage of you! I know that there are so many lovely poems out there for me to read… But right now… I just DON’T have it in me!!! Simply writing is quite painful right now. I don’t know if any of you know me, but I am a part of the Jingle Poetry ‘collective’, and for the past month I’ve even taken a hiatus from that, from my Thursday Poetry Form posts… Can I still post with you? Or should I just stay away? *gaaaaaah* Sorry, I’m going on and on, aren’t I? Thank you so much for the post! For your dedication! For your inspiration! For having the strength to be there!!! Wrote something reminiscing the past.Hope you’ll like it..It is about how we may live in our present, but we r always attached to our past.. So my first week in maybe 10 I don’t have a poem…so I will check out others to read later on. Still psyched 😉 to be here! Kim…you are so awesome! Appreciate the reading 🙂 and of course…welcome back! Thanks for hosting Natasha. Something a little more positive from me this week. Thank you James…and I do think you know by now how wonderful it is when you share your words with us! Poet Power! rock n roll…happy openlinknight everyone and great intro tash…write those poems…turn the crap into something beautiful…see everyone out on the trail soon enough…smiles. Awww Tash, Great intro, but you don’t have to thank us for what we love to do! Thinking we’re all in that same crazy boat!! Look forward to reading some good poems though. Glad to see tasha running things. I might even have a drink now ……………..
Henry! At least let me buy the drink! You were missed more than you know! That’ll work if I can buy the dinner after. I haven’t reached ur poem yet. I’ll be back for that Vodka. Missed ur kind tashtoo too. We all need a little magic from time to time. Happy to be here again with so much incredible talent. Cheers! I’m trying the narcissist route… I wrote a song about me.. but… it’s sort of under the title of branding myself and my blog and what my life is about. I’d like to hear what thoughts people have! Thank you Natasha for hosting. I will do my mother job–I hope you’re in bed soon! (wherever you are). it is nice to be in the EST timezone for an OpenLinkNight…. now i know how much fun you’re having in the pub while i’m sleeping when i’m in my time zone…smiles…but now def. have to go to bed now…good night poets and see you tomorrow..
yep on the way out myself…time to get some sleep….see you in the morning poets…. Am always late but enjoy making my weekly ritual visit here. Thank you for your welcoming words. Hi Tash, hi folks… it’s been a long day (and night) at work – we’ve all had those days – so I haven’t had the chance to circulate yet, but today looks a little better… and I am eager to see what everyone has put together. It’s what keeps me sane! Anyway, if you’re wondering where I am, I’m caffeinated and off to work… Will get back later today! What! I forgot to stop into the pub and say hi to everyone. Stopping by this morning. Having a little trouble waking up and getting started but wanted to say that I’ve enjoyed all the poems I’ve read so far. Coffee and cereal time. Thanks to everyone who has come by. You’re all welcome! I had heard a lot about dVerse and decided to take a look around. But I am afraid I might have been a bit late in linking my poem. Yay! 🙂 On my way! Looking forward to reading everyone’s poetry tonight! Thanks for the opportunity to share 🙂 This is a wonderful blog community. Well, it was a long day today as well, but I’m finally in the pub, and thirsty for poetry! Nice intro Natasha, glad to be here!